Target: Non Metallic Resources, Inc. Non Metallic Resources, Inc. manufactures dual laminate and FRP products. It offers various products, such as vacuum infusion, FRP fabrication, thermoplastic fabrication, and custom fabrication; engineering services, such as system design, field dimensioning, finite element analysis, material selection, and specification support; and field services, such as mechanical installation, onsite field welds, modifications, inspections, and dual laminate and FRP repairs. The company was founded in 1983 and is based in Mobile, Alabama. The company together with SealTech Inc. provide turnkey, design-to-installation solutions for an international customer base that includes leading corporations in the power generation, chemical processing, pulp and paper, and mining markets, as well as the major engineering, construction services firms that serve these markets. 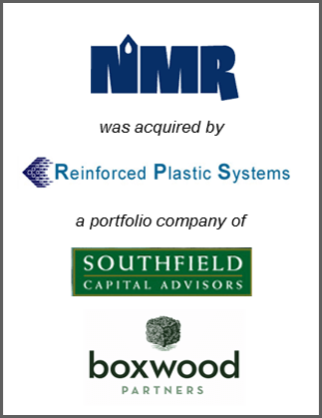 Boxwood Partners advised on the sale of Non Metallic Resources, Inc. and SealTech, Inc. to Reinforced Plastic Systems, a portfolio company of Southfield Capital Advisors.